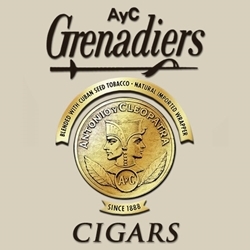 Antonio y Cleopatra Cigars also known as AYC Cigars, are machine-made premium cigars with a long history of satisfying American cigar smokers ever since they were established in 1879. These machine-made cigars are a well-known brand to most of the world’s cigar smokers. They are priced at a low discount online cost and made in flavored selections offering a fairly mild taste in Connecticut Shade natural, Connecticut Broadleaf Maduro and Java-grown wrappers. Machine-made in Cayey, Puerto Rico, the filler tobaccos are all Cuban-seed with a sheet binder. AYC cigars are American machine-made cigars, produced under strict quality control standards in Puerto Rico. Every cigar is manufactured by machines operated by experienced craftsman from tobacco grown from Cuban seeds. Unlike many machine made cigars, AYC cigars have a reputation for quality, construction, and consistency that produces a smooth mild even draw. Cigar lovers everywhere have grown to appreciate how good quality machine made cigars like Antonio y Cleopatra are. Smokers Discounts believes you will value and love them too! We’ve made it easy and affordable to buy AYC Cigars online. Call us for more details!